How Long Does It Take for a Beginner to Do Pushups? 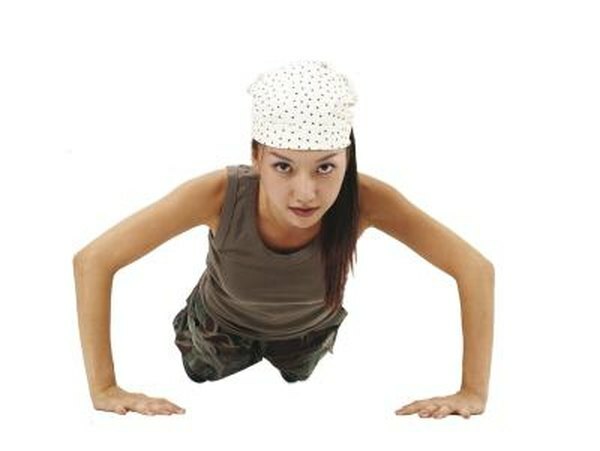 One of the first milestones you can reach in resistance training is being able to perform a pushup. Pushups require upper-body strength and core stabilization. The length of time you can expect to perform a pushup depends on how often you are training and how much strength you currently possess in your upper body and core. A general rule of thumb is six to eight weeks for someone who has never been able to perform a pushup. The six-week time frame coincides with the neurological adaptation period of training associated with novice lifters, which is also six to eight weeks, according to Dr. Jack Wilmore’s “Physiology of Sport and Exercise.” Your nerves are important for the coordination of muscle movements and teaching your muscles to fire at the correct time. Performing exercises that mimic the pushup and practicing a pushup even if you can’t do a full one are ways to improve the coordination and strength in your muscles so that you can eventually perform a full pushup. Modified pushups reduce the overall load on your chest muscles so that you can practice the movement pattern of the pushup while still gaining some of the strength benefits of a regular pushup. You will need a soft exercise mat or pad. Lie with your stomach flat on the exercise mat with your legs in full extension and your hands placed under your shoulders. Place your knees together and cross your feet at the ankles. Lift your feet off the floor. Now, push your upper body off the floor, utilizing the muscles in your chest and extending your arms. The weight of your body should be supported by your arms and knees. After you reach full extension of the arms, lower your body back toward the floor until your chest is about two inches from the floor. You may then repeat the extension of your arms. Repeat until your chest muscles are fatigued. Smith machine pushups allow you to practice pushups with full leg extension. They also decrease the load on your upper body because more of your weight is distributed to your legs. To perform, adjust the height of the Smith machine bar so that it is two to three feet off the floor. Place your chest and hands on the bar with your hands spaced shoulder-width apart. Step back with your feet until your body forms a straight line. Now, push up by extending your arms and contracting the muscles in your chest, triceps and shoulders. Reach full extension with your arms and then repeat. You may raise the bar to make the exercise easier or lower it to make the exercise more difficult. A pushup is performed with full leg extension with your hands on the floor. The modified pushup addresses the hands-on-floor portion of the pushup, while the Smith machine deals with the leg extension portion. When you can perform at least 20 modified pushups and 20 Smith machine pushups on the lowest bar setting, you should be able to progress to regular floor pushups. If you still are unable to perform pushups at the end of six weeks, you core muscles may not be strong enough to support your weight throughout the lift. American Council on Exercise; I Struggle to Perform Push-Ups. Any Tips on How to Properly Perform This Exercise?